What many of those links fail to mention, however, is that there is no one-stop answer for how to make teamwork work with your specific team. All teams are different, and those “Top 7 Teamwork Tips” aren’t going to apply to everyone. Before you start figuring out how to make teamwork happen, figure out what type of team you have. What do your team members need? Here are a few general team types to get you started. This team is full of self-starters. Each individual is truly the boss of their own position. Everyone meets deadlines, conversation is minimal, and work is always getting done. Projects are completed on a personal rather than a team basis, and there isn’t a huge need to encourage teamwork. This type of team doesn’t thrive under the typical weekly meeting schedule. Since everybody is already on task, a weekly meeting can often be a waste of time. You might want to consider opting for a monthly or biweekly meeting instead, just to get progress reports and inform team members of upcoming projects. It can be tempting to think you need to meet weekly because, well, that’s what teams do. 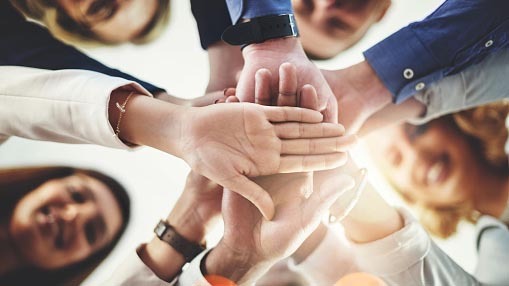 But not all teams need to be told “teamwork is awesome,” or “we can do more by working together.” Some teams work best when each member handles their own job, and checks in with other team members as needed. If your people don’t require frequent collaboration, don’t force it. Other teams are on the complete opposite end of the spectrum. In a given day, one team member will need to contact three or four other team members just to get a single project started. Collaboration is the name of the game, and frequent conversations are necessary to get the job done. A single missed deadline can derail multiple projects, so structure from the top is a must. Due to the ever-shifting nature of projects on a team like this (and especially if the team is relatively large), regular meetings are a must. Consider “micro-meetings” in addition to the traditional weekly meeting. Daily brainstorming sessions can help (giving you an idea of where everyone is on a given day), as can using an online communication platform like Slack. The key is to foster a community of cooperation without bogging down certain team members with constant interruptions. This team is a combination of the previous two. Half of your team are self-starters who don’t need to collaborate that much, while the other half need frequent collaboration to get their jobs done. This can be hard to navigate. How do you encourage and foster a team with such a diverse dynamic? By acknowledging team members are different. Think of your team as two separate squads—if your self-starters don’t need frequent meetings, don’t require their presence at every meeting. Set an agenda and only invite the people who need to be there. And if your collaborators need that daily brainstorm? Maybe make the brainstorm an email thread or have a “collaboration tree” full of sticky note ideas somewhere in the office. Make sure there are boundaries—if your self-starters need a day of solitude, let your collaborators know to keep interaction to emails that day. You could even set a certain day of the week as a collaboration day. Teams are full of individuals, and different combinations of individuals need to be led differently. There is no one-size fits all leadership method. Analyze your team, figure out how all your puzzle pieces fit together and come up with a unique form of leadership to match your people. What type of team do you lead? Let us know in the comments section below!